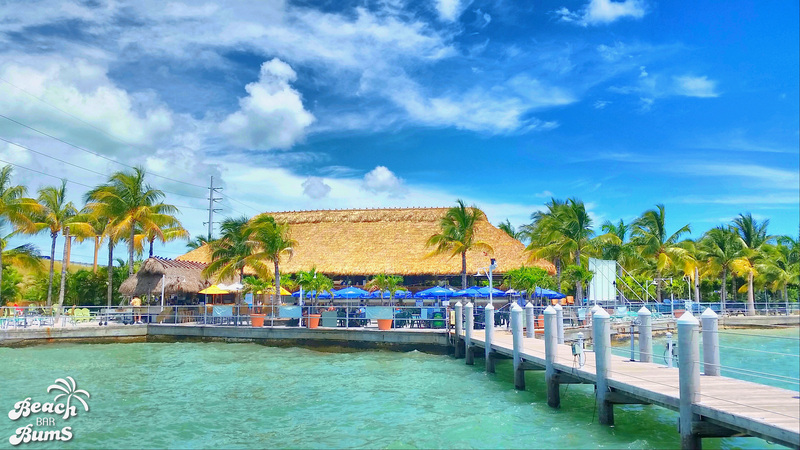 One of the questions I get asked a lot is “Any recommendations on bars I should visit during my Florida Keys road trip?” It speaks not only to the popularity of the Florida Keys as a destination but the visceral reaction one experiences when cruising through America’s Caribbean. It’s an atmosphere not easily replicated anywhere else on the continent and a major reason people just can’t get enough of this region. 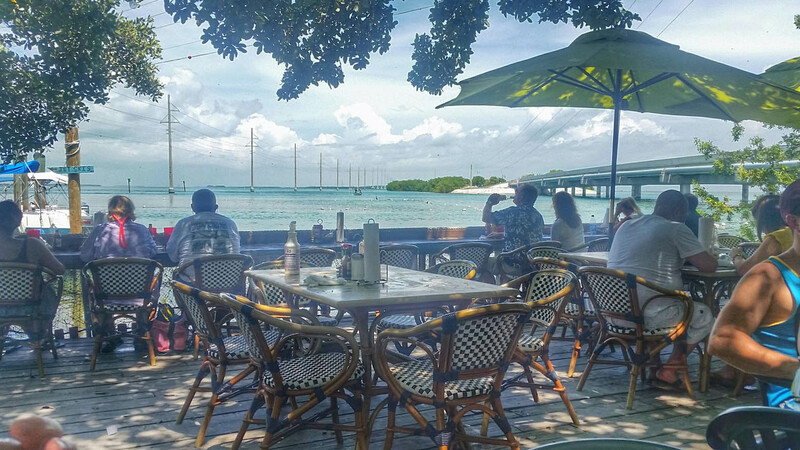 Road trips beget pit stops so if you’re planning your next jaunt through the Florida Keys, make sure to put these following bars on your to do list. I don’t condone drinking and driving so please act like the responsible adults we all know you are and emphasize moderation over excess. The bars are from north to south since most road trips in the Florida Keys occur in that direction. No Key West bars are included since they would populate the article on their own. Locals in the Florida Keys refer to locations by the mile marker and whether or not it’s on the Gulf of Mexico side (“Bayside”) or the Atlantic Ocean side (“Oceanside”). I’ve included those references in the descriptions below as a general guide to these bars/restaurants. I don’t know if these actual mile markers have signs but they function quite nicely as a reminder to start looking for the next bar/restaurant. 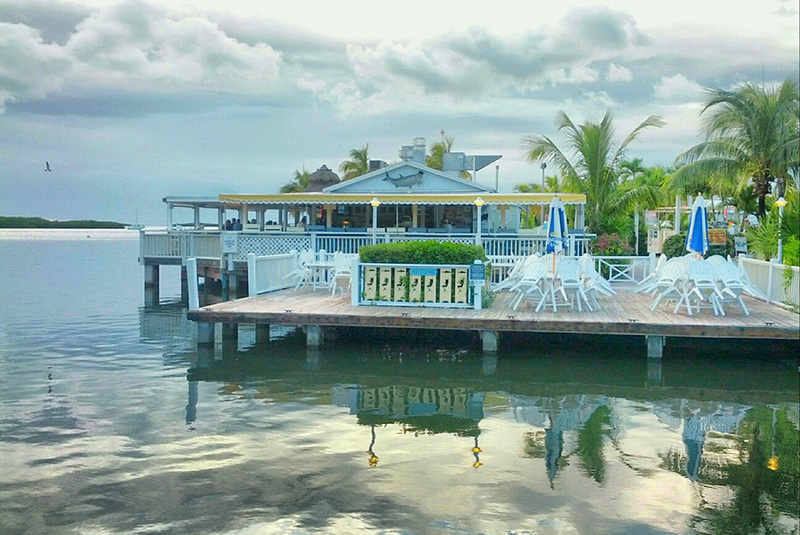 Located on Card Sound Road, Alabama Jack’s requires a detour from the typical Florida Keys road trip route. It might extend your road trip a little bit but it’s worth it. It’s location on a canal in the middle of nowhere is just part of its appeal. The bar’s classic throwback appearance and laid back casual ambiance combined with excellent food offerings make this slight detour a must. Plus, the t-shirts are some of the coolest you’ll find anywhere in the Keys. Instead of continuing south on Highway 1 out of Homestead, hang a left on Card Sound Road. You’ll find Alabama Jack’s toward the end of the road, right before Little Card Sound and the toll booth. Once you arrive at Bayside Grille, grab a table as close to the water as you can and then settle in for the sunsets. It’ll be worth the wait. If you can’t wait that long, they’re known for their musical entertainment so chances are, you’ll be offered a musical interlude to your road trip. It’s a little hard to find. Look for the CVS where Highway 1 splits into two different roads. You’ll find the entrance on the right side of the street across from CVS and will have to drive behind Café Largo. 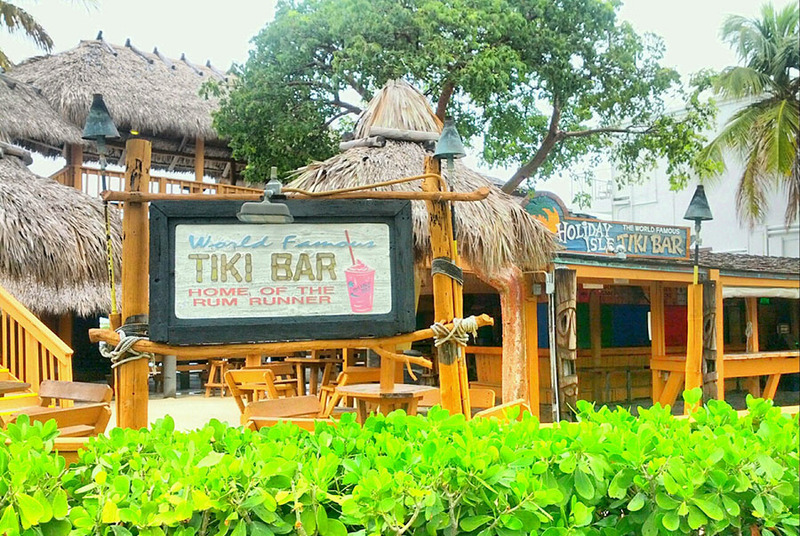 The world famous Tiki Bar at the Postcard Inn is, well, world famous, at least according to the owners of the resort. Locals and visitors would probably reaffirm that belief as this tiki-styled watering hole offers plenty of space for everyone in a multi-level bar that seems to go on forever. 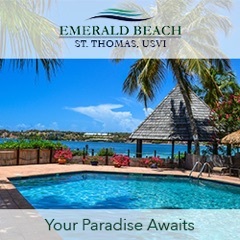 Enjoy views of the marina, beach or water from this popular bar, proof positive that resorts can have pretty cool bars as well. 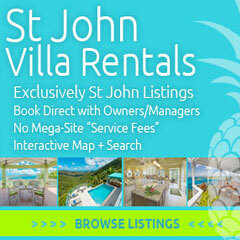 They also have at least three other bars on property, making a stop at this resort a no brainer. It’s on the southwest end of Windley key, just before the Windley Harbour Cut/Whale Harbor Channel. You can’t miss it. Like the aforementioned Bayside, grab a table as close to the water at Lorelei as you can and wiggle your toes in some of the softest sand you’ll find in the area. The sunsets are worth the wait if you have the time. It’s one of my favorite spots in the Florida Keys and if you have to limit yourself to just a couple spots, make sure this one is one of them. Madeira Road is across the street from Guy Harvey’s Islander Resort so it’s easy to find. Turn right onto Madeira and take it to Lorelei. 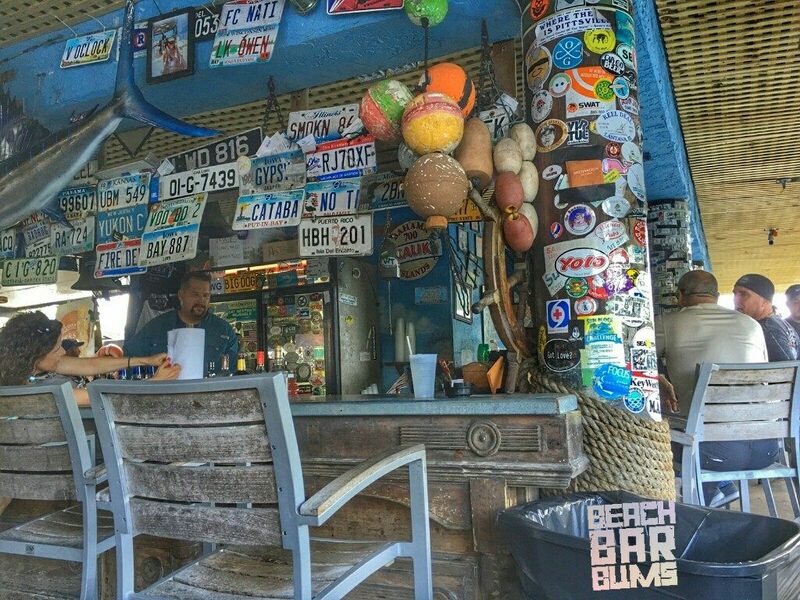 Robbie’s technically has two bars, the Hungry Tarpon and the Thirsty Tarpon but it’s hard to delineate the two. One is the actual bar, I suppose, and the other is the dining area adjacent to the bar (you can probably guess which name applies to which area). This pit stop is more than just the bars, though, as vendor stalls and stands selling every kind of knickknack you could ever want dot the property (Robbie’s itself has an extensive apparel collection for sale). It’s also a marina so there’s the whole boat thing if you want to do that. If you end up here, feed the tarpon – they’re hungry and thirsty and it’s the best money you’ll spend on your road trip. It’s at the northeast tip of Lower Matecumbe Key just past Indian Key Channel. Once you cross the bridge and spot it, take your first right and make another hard right. You’ll find it at the end of the road. If you can only hit one bar/restaurant on your road trip, make it to the Sunset Grille. Located at the east end of Seven Mile Bridge, it offers fun for the whole family and includes a pool, a couple bars, plenty of souvenirs, good eats and drinks and beach/lawn games. Did I mention the incomparable view of Seven Mile Bridge? 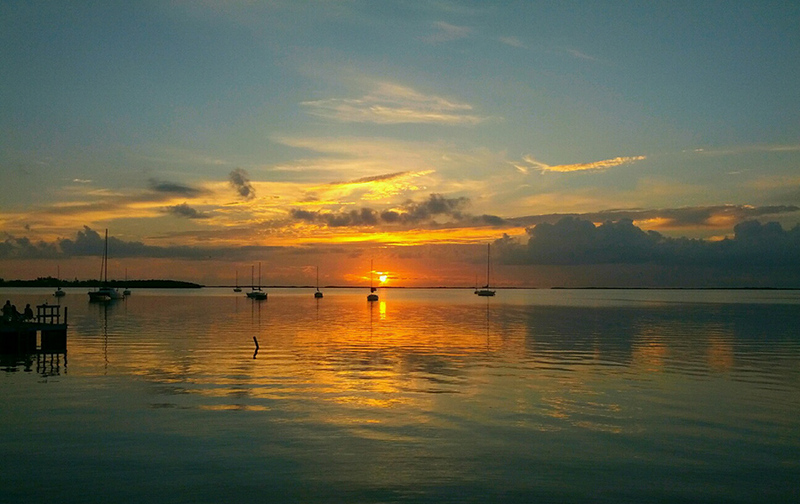 Do yourself a favor and make the short walk over to the old bridge, now part of the “Florida Keys Overseas Heritage Trail.” Not only will you have the chance to snap some great pics for your Instagram feed, you’ll also be able to walk off some of that food you’ve been devouring at the previous stops. And if you were too early for the sunset at Bayside, this your chance to catch it. Let’s put it this way, if I lived anywhere near this place, I’d be here every day and wind up broke and on the streets. You’ll have to turn before you get to the bar so start looking for Knights Key Blvd. once you pass Porky’s Bayside. Turn left onto Knights Key (same exit for the Knights Key Campground – should be a sign) and take this street to the bar. Keys Fisheries – My brother swears by it. Plus, almost every time I mention it somewhere on social media, people respond with “Lobster Reuben!” Apparently, it’s really good and the size of your face. Did I miss one of your favorite waterfront/beach bar locations? If so, let me know in the comments and I’ll try to get them in a follow-up article. The only criteria is they have to be on the water or beach. Thanks!